Coolants in the production process inevitably become contaminated with dirty oil, grease and particulate materials loosing valuable cooling properties, which in turn leads to drastic reduction in quality of the workpiece and the service life of tools and machines. Contaminated coolants are also ideal breeding ground for bacteria and fungi that are responsible for the odor and increase the risk of infection for the machine operator. These problems can be solved by using OIL SEPARATOR ECO-4. The separator in a very efficient way cleans the coolants from oil and other impurities extending the usage of coolant in some cases even twice. This allow for savings not only on the coolants but also on the costs of utilization of dirty coolants. The separator is made of stainless steel, it is mobile (on wheels), what allows its usage at multiple machines, and it operates in a "by-pass" mode so it can be used without interrupting the operation of the machine (lathe, milling machine, etc.). 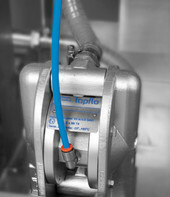 Coolant flow through the separator is forced by a membrane pump powered by compressed air, so there is no need to connect the device to the electricity. The separating coalescence insert is made of polypropylene corrugated plates. 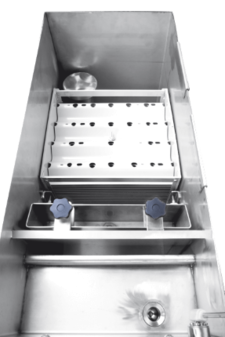 sterilizer specially designed for coolants. 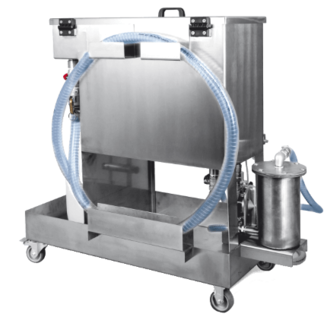 OIL SEPARATOR ECO-4 is a mobile device designed for cleaning coolants from tramp oil.